Top Fundraisers Ken Romano (right) and Richard Ayer (Left) with Kathy Metz of the American Cancer Society. 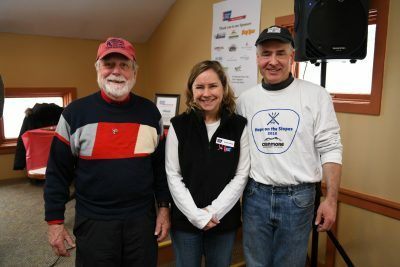 NORTH CONWAY – This weekend’s 41st annual American Cancer Society’s Hope on the Slopes Race to Beat Cancer raised almost $13,000 for cancer research and patient services. Volunteers participated in a fun-filled day on the slopes including skiing and snowboarding races at Cranmore Mountain, North Conway. “Mount Washington Valley residents, second home owners, and visitors alike really showed their spirit this weekend,” said Kathy Metz, of the American Cancer Society. The top individual fundraisers were Ken Romano of Lynnfield, MA who brought in $2,250.00 and Richard Ayer of Glen, who raised $1,665.00 from friends and family. American Cancer Society’s Hope on the Slopes Race to Beat Cancer was made possible by our sponsors, Cranmore, Storyland, Clean Cut Construction, Amoskeag Beverages, Flatbread Company, Memorial Hospital, First Allied, North Country Dental, Northway Bank, The Mount Washington Radio Group, Bear Notch Ski Touring, FX Lyons, Jackson Community Church, The Shannon Door Pub, Valley Originals and the Wentworth Hotel as well as many local businesses who donated goods and services for the top fundraiser prizes and raffle fundraisers. Volunteers interested in serving on the 2019 planning committee are now needed. Join other area residents to help organize this fun and meaningful event. For more information please go to www.HOTSNH.org or contact Kathy Metz, of the American Cancer Society at 512-490-8787 or (800) 227-2345 or [email protected].